What is Phytophthora root rot? Phytophthora root rot is a common disease of Christmas trees including Douglas-fir, balsam and as well as true firs (e.g., Fraser, balsam and Canaan), spruces, and pines. The disease has caused significant problems in Christmas tree production in several states. 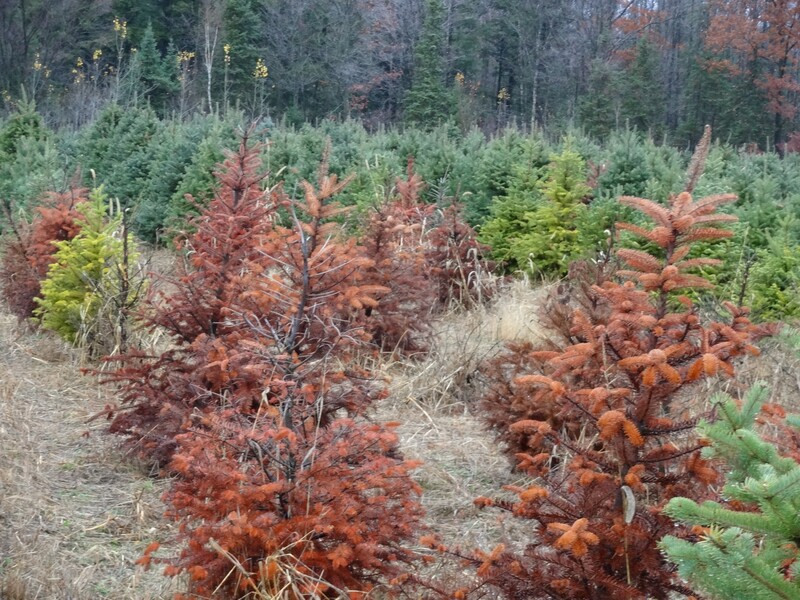 In Wisconsin, losses due to Phytophthora root rot have been particularly high in Fraser fir Christmas tree production. What does Phytophthora root rot look like? Symptoms of Phytophthora root rot are often not observed until the disease is quite advanced. Above ground, affected trees initially have single branches (typically low on the tree) with needles that turn from green to yellow to red-brown, and remain on the tree. Soft, sunken areas (i.e., cankers) may also form on trunks near the soil line. As the disease progresses, trees wilt and die. Below ground, affected trees have root systems with a reduced number of fine, water-absorbing roots. What roots remain are often black and lack white growing points. The outer tissue of these roots easily sloughs off and the interior root tissue is also typically discolored. Discolored roots may, but oftentimes do not have a foul odor. Where does Phytophthora root rot come from? Phytophthora root rot is caused by several species of the fungus-like organism (i.e., water-mold) Phytophthora. WI DATCP staff have recently identified six Phytophthora species (P. cactorum, P. europaea, P. megasperma, P. plurivora, P. sansomeana, and P. sp. ‘kelmania’) that can be involved in Christmas tree root rot in Wisconsin. These organisms can survive for many years in soil and plant debris as thick-walled resting spores that can eventually germinate and directly infect trees. Alternatively during wet periods, certain of these resting spores can germinate to produce swimming spores that are attracted to the roots of Christmas trees and other host plants. Resting spores can be moved from field to field on seedlings and transplants, on soil clinging to field equipment and hand tools, in irrigation or flood water, and even on boots and shoes. Extensive external and internal darkening of root tissue is typical of Phytophthora root rot. suffering from Phytophthora root rot, have them examined by a professional plant disease diagnostician. If the diagnostician confirms Phytophthora root rot, dig up and burn any symptomatic trees and limit access to the area of the field where the trees were grown. Quarantining the area can help limit spread of contaminated soil to other areas of the field. Fungicide treatments will NOT cure trees suffering from Phytophthora root rot. However fungicide treatments in the last year of production may be useful in limiting development of visible root rot symptoms on trees growing near a Phytophthora-infested area so that these trees can be successfully marketed. Fungicides containing mono- and di- potassium salts of phosphorous acid, metalaxyl (mefenoxam) and etridiazole are registered for Phytophthora management in Christmas tree production in Wisconsin. DO NOT use the same active ingredient for all treatments. Alternate the use of at least two active ingredients with different modes of action to help minimize problems with fungicide-resistant strains of Phytophthora. Be sure to read and follow all label instructions of the fungicides that you select to ensure that you use them in the safest and most effective manner possible. How do I avoid problems with Phytophthora root rot in the future? Choose sites with well-drained soils and avoid planting in low areas where water drains and pools. DO NOT plant Christmas trees in sites that may have had a history of Phytophthora root rot including nurseries, orchards and soybean fields. Phytophthora species that cause problems on shrubs, trees and even soybeans can also cause problems on Christmas trees. Buy healthy Christmas tree seedlings from a reputable grower. Carefully plant seedlings making sure that planting holes are large enough for roots to spread in all directions. This will reduce the likelihood of girdling or J-roots that may make trees more prone to infection. Also, minimize root wounding at planting, and avoid soil compaction by heavy equipment. Water trees adequately, but DO NOT overwater. Use well water for irrigation, if possible. Avoid using water from ponds, rivers and streams as this water may be contaminated with Phytophthora. Routinely inspect Christmas tree plantings for symptoms of Phytophthora root rot and follow the recommendations outlined above if you notice symptoms of the disease.